The Corner Guesthouse is a new choice for those who are fascinated with the vibrance of Patong life. The 3 story building is newly renovated – safe and clean. 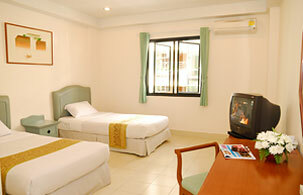 This new Patong guesthouse offers 11 standard air-conditioning rooms with either single or twin beds. Besides its just-like-hotel service, along with the same administration team from famous The Royal Paradise Resort and Spa, guests can benefit the hotel facilities without any limitation. The Corner Guesthouse is strategically located in a convenient location on Rat-U-Thit 200 Pee Road. Surrounded by facilities and entertainment venues, it is within walking distance to Bangla Road, Jungceylon shopping centre, Patong beach and so many more. The Royal Paradise's facilities such as swimming pools, fitness centre, spa, diving shop, tour desk, laundry service, in-house restaurants, taxi service etc.